On January 20th Donald J. Trump will assume the office of the presidency to become the 45th president of the United States. Unlike his predecessors, his presidency will begin under circumstances far different than those before him. He will inherit an aging business cycle, a tightening monetary policy, close to $20 trillion in national debt and a perilous international environment. Since the end of WWII, the United States has experienced 11 recessions over 13 presidencies. Historically, it is not uncommon for a new administration to face a recession within the first year of office. Faced with a tightening monetary policy, a declining economy that eventually turns into a recession, most new presidents spend the majority of their first term in devising policies that eventually lead to economic recovery and hopefully a second term. This will not be the case with our 45th president. Both George W. Bush and Barack Obama began their presidencies in the midst of a recession and a Federal Reserve that was slashing interest rates in an effort to pull the economy out of recession. Both Bush and Obama entered office with monetary tailwinds at their back. Trump will face the opposite, a monetary headwind that could clash with his efforts to revitalize the economy and create more American jobs. Trump plans to change the economic tone in Washington from one of fiscal restraint to one of fiscal expansion. Monetary policy has reached the limits of its efficacy in stimulating economic growth so economists have recommended fiscal stimulus in its place. Trump ran a campaign that promised to do just that from individual and corporate tax cuts to massive spending on infrastructure and defense to regulatory relief. If enacted as proposed these policies could stimulate economic activity and job growth but would also be inflationary. As inflation rises we can expect the Fed to become more hawkish and aggressive in its rate hikes. Unfortunately, rate hikes eventually lead to recessions as every recession over the last half century has been triggered by a rate raising cycle—every one of them. The problem with monetary policy is that it is not an exact science where the effects can be precisely gauged and measured. The Fed’s economic projections are usually off more often than they are right with the last two years a prime example. In each of the past two years, the Fed has had to hold off on their goals of normalizing interest rates by raising the Fed Funds rate. The dot plot, a consensus of Fed rate projections, has consistently been lowered along with economic projections and inflation rates. This inability to measure effectively the precise rate of interest to slow an overheating economy has led to consistent mistakes of overtightening. The traditional rule among strategists is that the Fed will keep raising interest rates until something breaks: either the economy or the financial markets or, in most cases, both. All of the above policies signify an important regime shift that will impact the economic and investment environment over the first term of the Trump presidency. It marks the end of the era of falling interest rates, fiscal conservatism, and the beginning of anti-globalization, rising labor costs and inflation. Inflation and interest rates have bottomed in the US. The key to bringing about this regime shift is if the right set of policies are implemented. 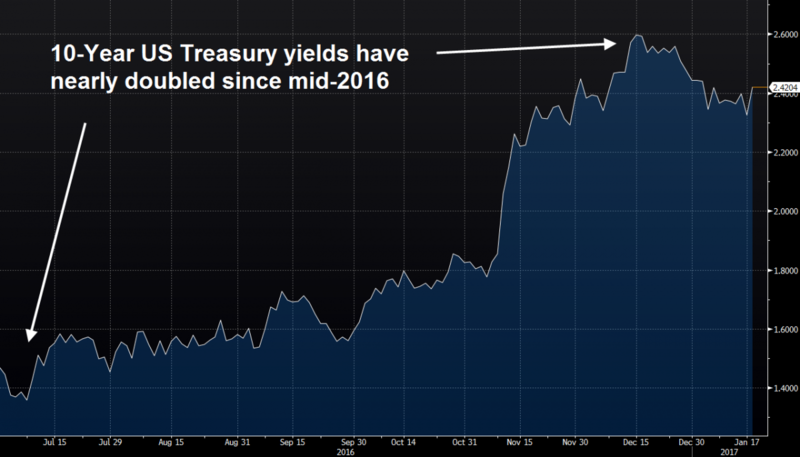 The determining factor will be what bond investors decide with yields, affecting the nation's borrowing costs - which have doubled since their historical lows reached last summer. If the potential problem of a clash between fiscal efforts to stimulate the economy and monetary policy bent on tightening weren’t enough, there is also the issue of the national debt which has quadrupled under Bush and Obama. As of this writing, the US national debt is approaching $20 trillion. Both Bush and Obama doubled the national debt more than all of their predecessors combined. President Obama doubled the national debt by $10 trillion during his two terms in office. Fortunately for Obama, his entire two terms witnessed the longest period of declining interest rates with rates last summer reaching the lowest level in recorded human history. This has allowed the Obama administration to pile on a mountain of debt and finance that debt with low rates, which kept the deficit under control. In 2008, US government debt stood at $10.02 trillion. Interest on that debt was $451.2 billion. In fiscal year 2016, the national debt stood at $18.2 trillion with an interest expense of $432.7 billion. Even though US national debt increased by over $8 trillion, interest expense fell by $20 billion due to falling interest rates. 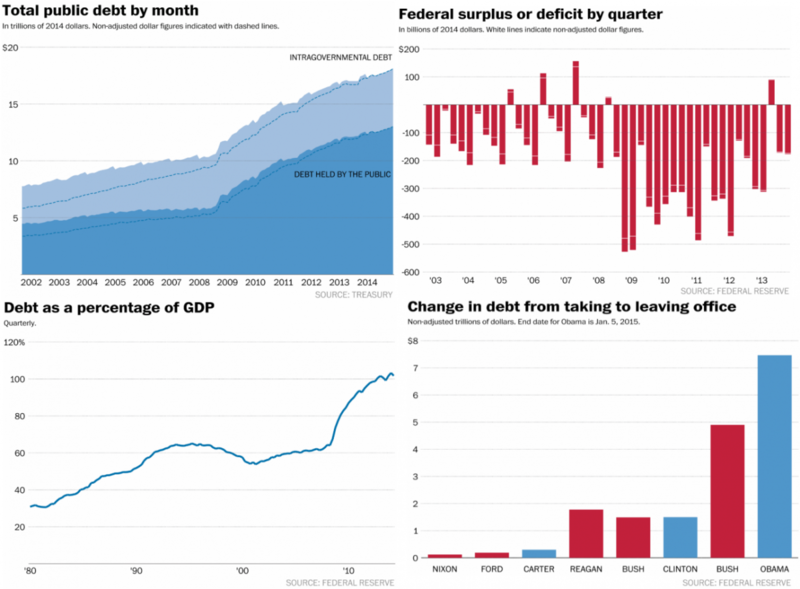 This trend can be viewed in the four graphs below taken from an article on Obama and the national debt from The Washington Post. The national debt and interest rates could become two factors that hinder the incoming president’s efforts to stimulate economic growth. Today, 68% of the government’s budget is composed of entitlements and interest on the national debt. Both are on auto-pilot and rising, which leaves little room for discretionary spending without additional sources of revenue. Unfortunately, the quadrupling of national debt first under President Bush and then again under President Obama leaves nothing to show for it. The country's infrastructure is crumbling and becoming Second World while our military is short of personnel from pilots, seamen, soldiers to weapons systems that are aging or in disrepair. Trump promises to fix both with massive new spending increases. He faces an arduous task and it remains a question for the bond markets to decide. The key components of the new president’s economic agenda are tax cuts and spending on infrastructure and defense. Infrastructure and defense spending will require trillions of dollars of new spending to update, modernize, and fix. Every four years the American Society of Civil Engineers issues a comprehensive report assessing and grading America’s infrastructure from roads, bridges, drinking water, ports, aviation to wastewater, schools, and rail. The last report was issued in 2013 with a new report expected to be released in March of this year. 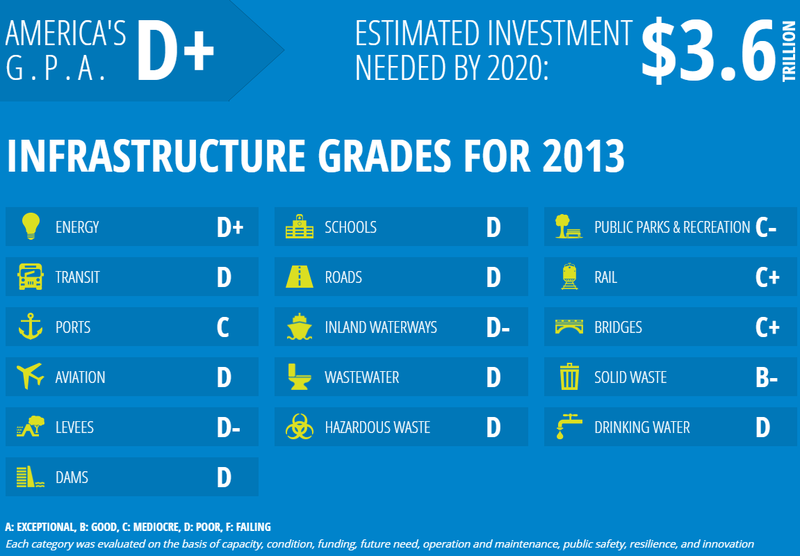 According to the last report, US infrastructure was given a D+ requiring an estimated $3.6 trillion in new investment to modernize and fix. The country faces a significant backlog of overdue maintenance across a broad array of systems. Failure to do so could significantly impair future economic growth. On the international front, the new president faces a dangerous and perilous geopolitical environment from the aggression of nation states such as China, Russia, Iran, and North Korea to the expansion of terrorist groups from ISIS, Al-Qaeda, and Boko Haram. The threat of terrorist attacks on US soil which have escalated over the last four years and the growing aggression of major state actors require a strong American military and presence in the world. No other nation is capable of deterring aggression like the US. Here too, like the country’s infrastructure, the nation’s military is in disrepair, in need of maintenance, and modernization in order to keep up and defend against growing threats to our security. Successful conclusion of a major war that has the potential to destabilize a region of critical interest to the US. Preservation of freedom of movement within the global commons (the sea, air, outer space and cyberspace domains) through which the world conducts its business. Threats are graded from severe to low. Currently, Russia, Iran, Middle East Terrorism, Af-Pak Terrorism, China and North Korea are graded high, while our force structure is graded weak to marginal. Like the nation’s infrastructure, the US military is suffering from aging weapons systems, shortage of personnel and training, maintenance to modernization, at a time when our adversaries are modernizing and expanding their military force structures. The following list of recent examples exemplifies the challenges of maintaining an adequate defense against growing threats. US Air Force is short 4,000 airmen to maintain its fleet and 700 pilots to fly them. The US Air Force has 30% fewer airmen, 40% fewer aircraft and 60% fewer fighter squadrons. Fighter squadrons are down from 134 in 1991 to only 55 today. The Air Force is facing a shortage of parts to maintain fighter bomber squadrons forcing it to cannibalize parts from boneyards in the Arizona desert. Only 9 out of 20 B-1 bombers at Ellsworth Air Force base in South Dakota can actually fly. Out of 79 F-16’s at Shaw Air Force base in North Dakota, only 42% can actually deploy due to missing parts. The US Navy has extended the average length of deployment from 2008-2014 from 6.4 months to 9 months for three carrier strike groups. Declining ship conditions and material readiness have increased the maintenance backlog and time spent in shipyards. The crux of these problems from infrastructure to defense will require trillions of dollars of new investment at a time the nation's burgeoning debt places limitations on the new president. Entitlements consume 68% of the government’s budget leaving only 32% to pay for and run everything else the government does. Where will this money come from without massive deficits and debt? Unfortunately, we have added $15 trillion in new debt since the beginning of this new century and we have nothing to show for it. Roads, bridges, levees and water systems have been allowed to deteriorate. The size of our military has been reduced while combat systems and equipment have been allowed to fall into disrepair. Deficit and debt levels are rising again along with interest rates. It is going to require astute planning and the right policy mix to dig our way out of this mess. The best way to do that is to get the economy growing again which will generate the extra tax revenues to help fund the nation’s infrastructure and military deficits. The President-elect has a bold agenda promising to increase economic growth, create more jobs, and spend massive amounts of money on rebuilding both our infrastructure and military. When Trump assumes office this January 20th, he will face the cold harsh reality of his inheritance: an aging business cycle, Fed monetary tightening, a crumbling infrastructure, a downsized military and $20 trillion in national debt. Unlike his predecessors, he will bring a different background to his presidency. He is not a politician even though he vanquished his political rivals. Business and government are two different worlds. Let us hope for all our sakes that he can bring his success in business and use those skills to navigate and transform government. "I hope Donald Trump is a good President. Wanting him to fail is like wanting the pilot to crash the plane that we are ALL ON."